After discussing geology with resident expert Amanda Finn, I developed the following understanding of the geology of Alaska. Alaska accreted, or merged with the larger continent, from the Pacific Plate colliding with the North American plate. These shifting tectonic plates created catastrophic earthquakes and many of the rock formations that you see in Alaska today. The three thousand foot metamorphic rock mountains in Misty Fjords were most likely formed from these collisions. Initially, there were sedimentary rocks that were changed from heat and pressure into metamorphic rocks. Because the sedimentary rocks were altered, the original age of these rock structures cannot be determined. Connor, Cathy. Roadside Geology of Alaska. 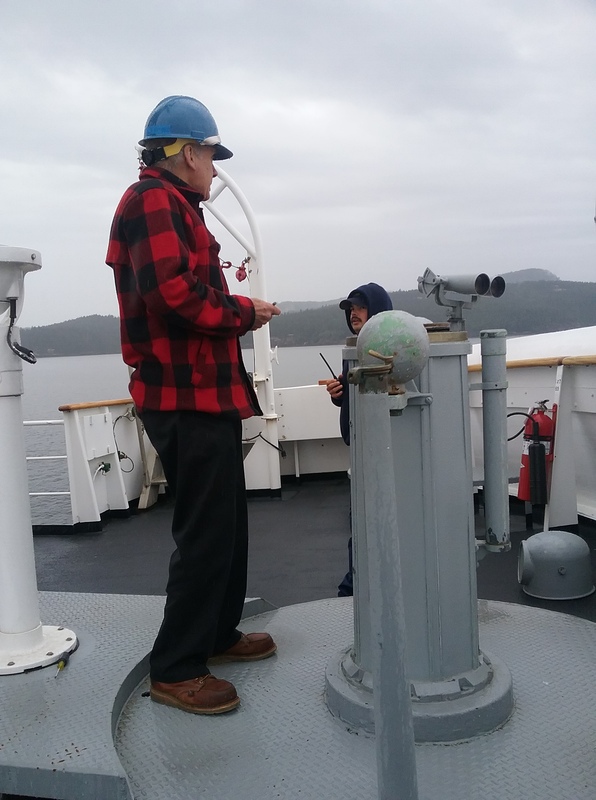 I met a compass adjuster who was picked up in a launch from San Juan islands who learned his skill from an apprentice. He carried a wooden box with his equipment and seemed like he arrived from another time period. I was fortunate to witness this annual ritual that compares the direction of the ship according to the magnetic compass with true magnetic North in a process known as swinging the compass A compass adjuster observes the difference between the ship’s compass and the four cardinal and four intercardinal directions to determine the difference. Since North and South were only one degree off, the magnets on the compass did not need to be adjusted. If there were a larger discrepancy between the two values, then magnets would be moved around until the directions came into alignment. A compass functions based on the Earth’s inner molten iron core which generates a magnetic field around the Earth. The needle in a compass points towards the magnetic pole, which is not necessarily the same as the geographic pole. This difference between magnetic North and true North is known as magnetic variation. In addition to magnetic variation, each ship has a magnetic fingerprint that alters the magnetic compass slightly. If welding were done with metal, especially iron, this would change the magnetic signature of the ship. The combination of compass deviation and magnetic variation alters the true bearing of the ship and must be considered when viewing the bearing of the compass. Since a magnetic compass differs from a true bearing, NOAA Ship Rainier has two gyrocompassses that are actually used for navigation. Each of these have a wheel spinning a gyroscope which is parallel to the Earth’s center of rotation, and do not rely on magnetism but depend on the Earth’s rotation and gravity. The spinning gyroscope, based on inertia, will always maintain its plane of rotation. 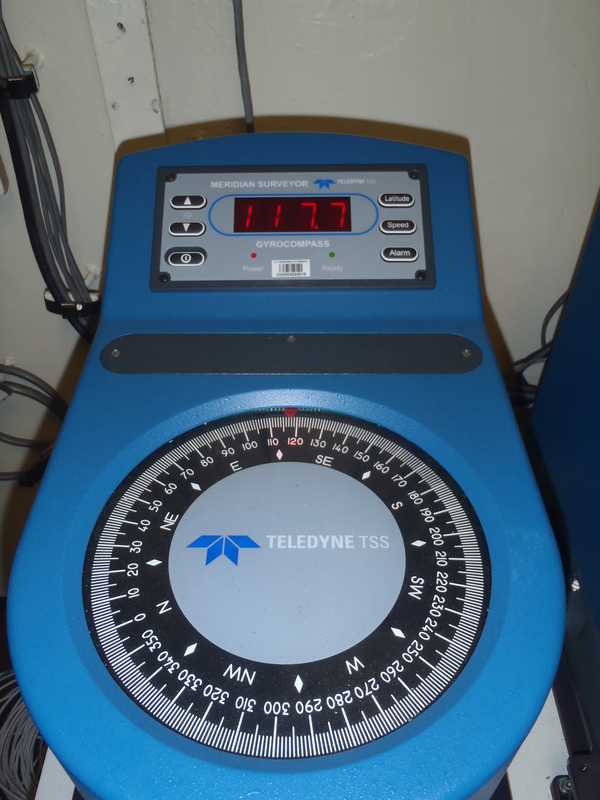 Since these gyrocompasses are not altered by the magnetic signature of the ship and provide a true North reading, they are utilized in navigation. The NOAA Corps navigator plans the track lines of the course of the ship based on the true North reading of the gyroscope compass and is the bearing that is observed from the bridge of Rainier. The magnetic compass acts as a backup if the vessel were to lose power. As I was relaxing in the lounge about to watch Black Panther yesterday evening, a call came in requesting my presence on the Bridge. When I entered the fresh air, granite mountains with ridges full of melting snow waterfalls and a breathtaking view welcomed me. To say I was awe inspired would be an understatement. We were in Misty Fjords within the Tongass National Forest, part of the nation’s largest forest about 22 miles west of Ketchikan. Observing a sliver of this almost 17 million acre temperate rainforest with evergreen trees amongst misty clouds for a brief period of time includes a moment that I will treasure. I was happy to share this experience with other crew, survey technicians and NOAA Corps members who weren’t currently on shift. While appreciating this beauty, I thought of a Japanese saying, “Iche-go Ich-e,” which means this moment only happens now. Observing the still glassy water reflecting the cloudy sky against green islands and three thousand foot mountains touched my soul. The enormity of the steep granite humbled me as I appreciated it in its untouched state. This pristine environment existed from a landscape formed ten thousand years ago by a massive glacier that created this geological phenomenon. Luckily, this Tongass National Forest was claimed to be a protected zone in 1978 by the president. I’m grateful for this natural beauty that invites a tranquil, peaceful feeling. When a blow spout of a whale appeared off the port side of the vessel, my elation couldn’t be contained and I was overwhelmed with gratitude. Lookouts use a coordinate plane-like reference for directions. If you are standing at the center of the Bridge, similar to the origin of a coordinate plane, then the y-axis would be dead ahead. The x-axis, or 90 degrees to the right would be beam starboard, while to the left would be beam port. To the right forty five degrees would be broad off starboard, while to the left forty degrees would be broad port. If you count the three equidistant points leading up to forty five degrees on the right hand side of the ship, you would command one off, two off or three off starboard respectively. 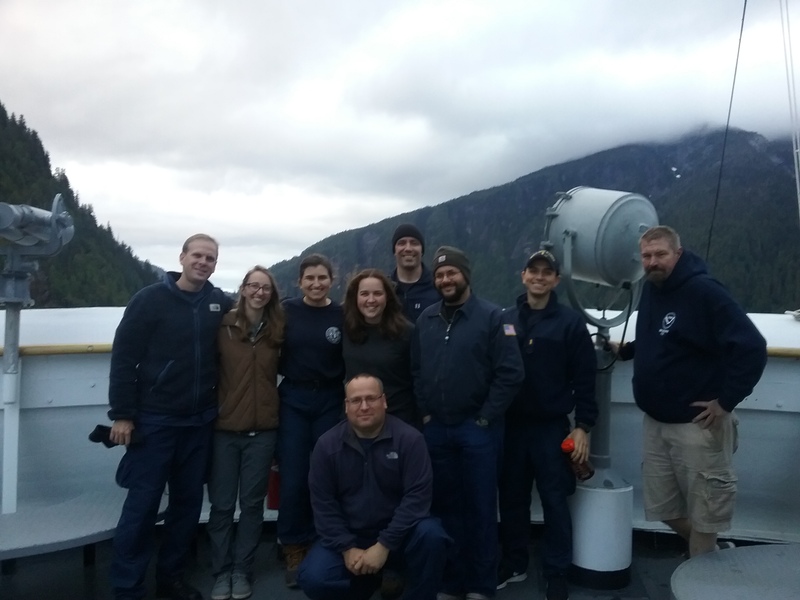 This entry was posted in 2018, Heather Oconnell, NOAA Teacher at Sea and tagged Alaska, compass, geology, gyrocompass, Misty Fjord, noaa ship rainier. Bookmark the permalink.